Wasabi, green tea and sake aren’t just foods in Japan, they’re also a few of the many versions of Kit Kats offered in the country. While the wafer-and-chocolate snacks have been available in more than 300 flavors here for more than four decades, recent offerings from custard pudding to ginger have made the nation the go-to destination for picking up odd variations. They’re so popular among tourists that Nestle SA is building its first Kit Kat factory in 26 years to meet booming demand. It’s no surprise, then, that the archipelago boasts the world’s second-largest consumption of Kit Kats. Nestle Japan will start operating a second factory in the western city of Himeji from August dedicated to making upscale, pricier versions of the snack. That’s probably a safe bet, thanks to Japan’s tourism boom. Spending by visitors surged to a record 2.5 trillion yen ($22.5 billion) in the six months through June, according to the Japan National Tourism Organization. 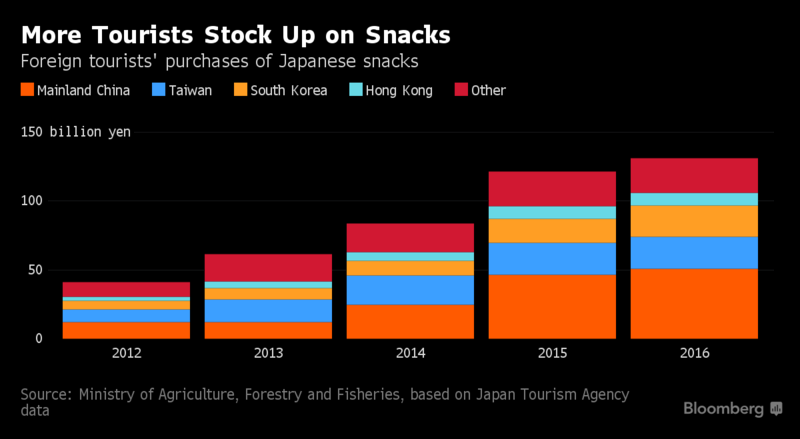 They’re also spending more on confectionaries, with candy consumption more than tripling over the past four years to 131 billion yen in 2016, according to the Ministry of the Environment. 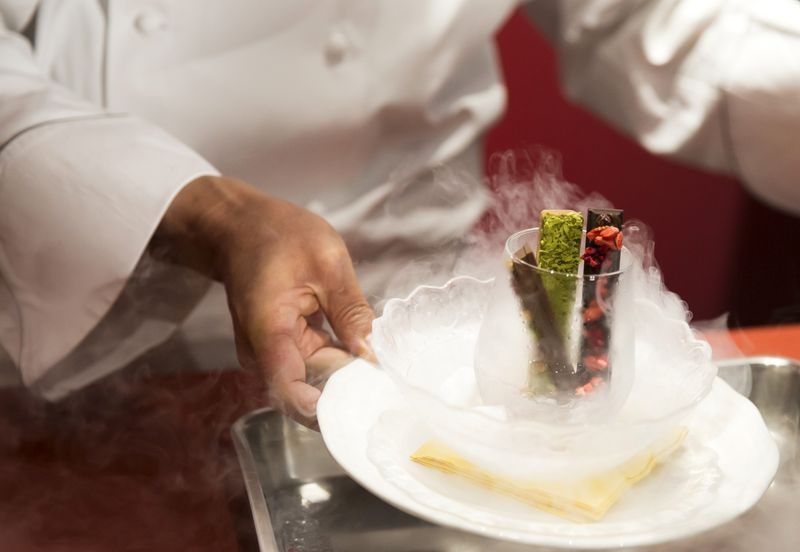 A popular destination for fans of the snack is the Kit Kat Chocolatory in an underground shopping center connected to Tokyo Station, where Nestle sells high-end flavors that can fetch more than 1,500 yen per package. 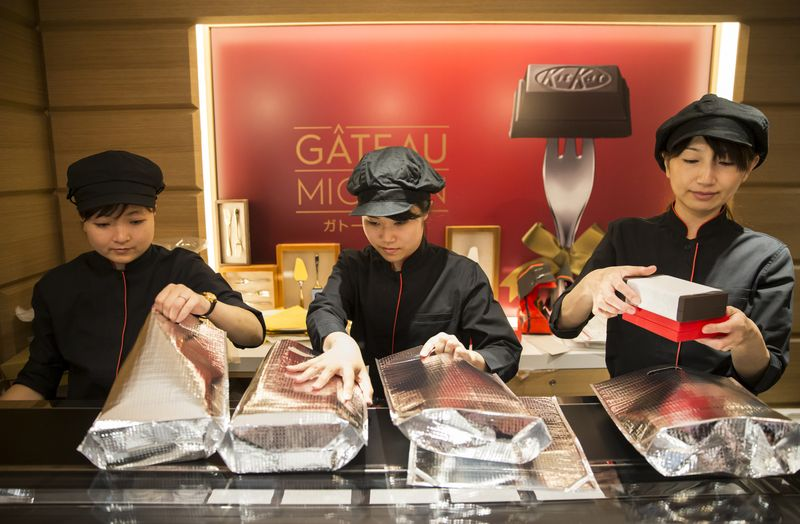 Boxes of gourmet seasonal flavors – raspberry and grapefruit – with some costing as much as 3,500 yen, or more than 10 times the cost of a regular bag of Kit Kats, are stacked across a counter, wrapped in gold paper. On Tuesday, Nestle Japan opened its renovated Chocolatory flagship store in Ginza, Tokyo’s main shopping district. 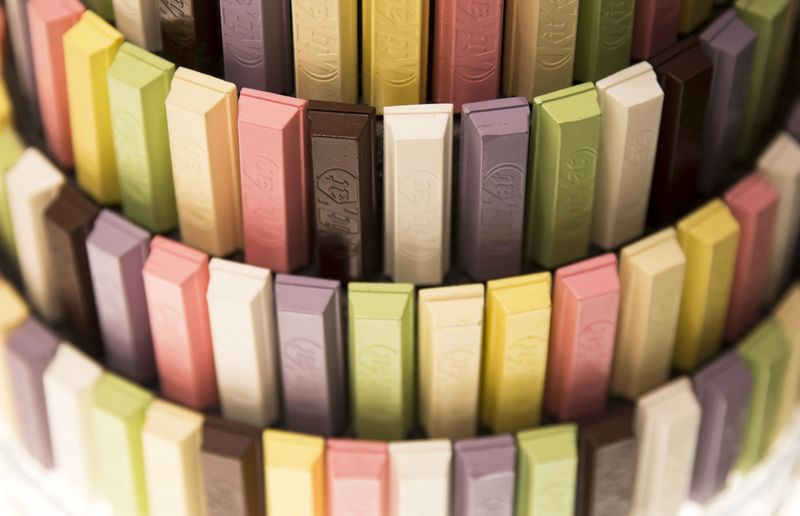 “We take pride in our unique flavors and I think that makes Japan special in the Kit Kat world,” Takuya Hiramatsu, a spokesman for Nestle Japan, said in a telephone interview, noting that the company offers 30 flavors now. He cited matcha as a favorite of tourists and locals alike, with visitors also snapping up flavors like wasabi, sake and purple yam. While Kit Kat chocolates debuted in the United Kingdom in 1935 and are an enduringly popular snack in North America and Europe, consumers in Japan embraced them in part because the product’s name sounds like “kitto katsu,” or “sure win” in Japanese. That has made them a popular gift for people about to sit for an examination, or take on an important project. Packages adorned with phrases like “Do Your Best!” and “Believe in Yourself!” are popular during school entrance exam season.